Our brickwork on walls, floors, columns, fences, fireplaces (and more!) can be laid in an array of patterns – just ask Greg for his most creative ideas! We’ve built new construction with “reclaimed” brick that came to us from old buildings. Bricks come in a variety of colors and texture, and we even work with thin “veneer” brick, which can be used just like regular bricks for most projects. Add in the options for your mortar colors, and you will be thrilled to have a truly unique project built to your exact specifications. Did you know that stucco could be placed over existing brick, block, or siding? It is typically used for exterior surfaces, but has had some popularity for indoor wall finishes over the years. Stucco is available in an array of colors, and is attractive and easy to maintain. 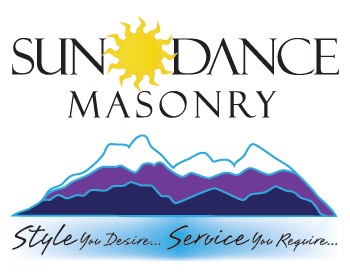 We use standard, acrylic, or synthetic stucco, and with our expertise we’ll help you to make just the right choice for your home or business. Using the industry’s best practices for stucco application, we apply it to protect the structural integrity of the building from the elements, especially water damage. Concrete blocks are generally used as the main structural element in commercial properties. We work with blocks to build structures, then put a façade on those concrete blocks with any combination of our stone, brick, stucco, or precast options to make your project look exactly like you want it to. There are no limits to the types of stone we have access to: Limestone,Slate, all types of Flagstone, Natural and Manufactured Stones, Stone Pavers, River Rock….Anything you can imagine, in a vast number of finishes and colors, can be brought to your doorstep. 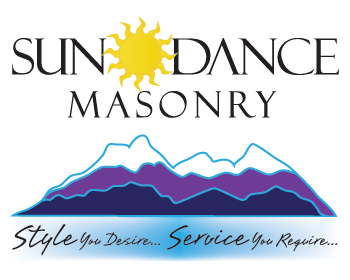 Our local suppliers are truly the best at ensuring that Sundance Masonry receives only the finest materials to use in your project. Visit our “Portfolio” page to see samples of our stonework! Precast concrete is a mold that is factory built, and brought to your worksite when it’s ready to be installed. While a “mold” may sound simplistic, installing precast with pins and glue is a technical effort, and takes an experienced professional. Precast molds are used in projects such as fireplace mantels, surrounds and hearths, retaining walls, railings and balustrades, ornamented archways and decorative accents. Using methods such as sandblasting and chemical treatments, precast has varying finishes, so you can choose to combine it with many other building materials and still have a great match. With long life and strong durability, precast concrete offers limitless choices – the designs can even be customized, so your project will be unique for your home or business. Concrete pavers are made from cement and aggregate that is poured into forms, compressed, and air cured. They can be formed into all sorts of shapes and sizes and pigmented in a wide range of colors. When used they create smooth, hard surfaces outdoors. Patios, outdoor steps, pathways, and driveways can all be constructed with pavers. They can be laid in a variety of patterns. Some people also use pavers to construct retaining walls and other landscaping features.